Quick little note here: Marcus made us a cool google map of my trip so you can go and check it out, if you happen to be so inclined. 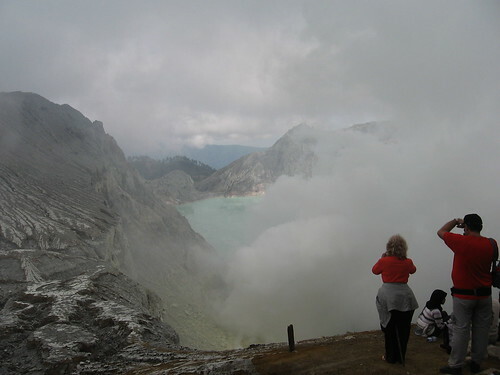 So we left off in Ijen. I waited around all morning for Allen, Luke, and Tabby. I was at the foot of the trail watching the van loads of French tourists show up and go up with their guides. For a while I sat around speaking English with an Indonesian who told me he had been in Iran with a gas company back in ‘79 when the Shaw fell and had to escape to Bahrain. Then it was the afternoon and they still hadn’t showed, I talked to an Indonesian guy in Indonesian and he told me we should become friends, which sounded ok to me. Then, after one beer this guy is telling me he can’t wait till I come to his city so I can give him free English lessons. I tried to tell him I get paid to give English lessons and that it didn’t sound that fun for me he kept insisting and forcing the matter. He texted my phone many times over the next week wondering when I was coming to give him his free English lesson, notice I haven’t texted him back. But I got no phone reception in the canyon, so I couldn’t contact my people. I didn’t want to climb the stupid mountain alone so I just sat and waited. The day crept on, I went for a walk, I ate, I drank beer, I slept, I read, and they still didn’t show up. Finally, after sundown when I had given up along the rode they came a-tootin. Some kind of hinkey brake issue had kept them in Bangawoso all day, which was now fixed and they were sorry. That night we drank every beer in the villiage, I am not kidding I think we drank every last one. Not a big village, mind you, only a few houses, but the entire stock of beer was gone in the morning except the one I found in my bed under my pillow the next morning which should go to show you the state of things that night. We laughed and hooted and howled. We walked under the stars in the deep dark and made wolf noises and told ghost stories, loud and slurrey ones. We were pissed! The next morning up at 5 to find the beer under my pillow, gyped by the beer ferry yet again. We were walking up the mountain by 6, it was still a bit overcast which was sort of a bummer, but the climb wasn’t difficult, I had seen worse. Much easier than the mountain I had climbed a few months ago. I saw a monkey with hair that looked like a bowl cut jumping around in the pine trees. 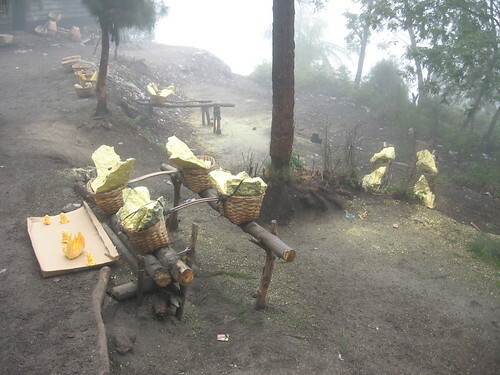 We also saw baskets of cut sulfur laying here and there, the sulfur minors where off for the holidays though. Our ascent ended on the top rim of the volcano, we made it in a couple of hours without really pushing it. From the outter rim of the crater we sat looking inside into a huge void of sulfur clouds, the rocky area around us was alien looking, totally a star trek world. We sat on a ledge talking about something or amongst the gaggles of other tourists, when out of the fog I saw a strange turquoise glimmer, a flash of a marrage. What was that, hey, I hollered and pointed, look the crater lake! Tourists jumped to their feet when I said that. Everyone whiped out their cameras, the cloud cleared a bit more and there it was smiling at us, like a reluctant celebraty meeting paparazi the crater lake had made its grand appearance, and what a sight! The color was a perfect baby blue. I didn’t understand, I tried to ask him about it but he ran the other way. At that very moment with the sudden unpredictability of campfire smoke an enormous gusting cloud of sulfur gas engulfed my existance. Instantly my nose was running and my eyes were watering and the coughes were gaspy wheezy can’t breeth coughs, I turned and followed Allen at top speed. I panack climbed up a rock face to avoid the long switch back of the trail ahead, desperatly grasping at handfulls of dirt and sand, trying like hell to pull myself to the air, wheezing and fretting. Finally when I got to about half way up the smoke disapated and I could breath. The crater lake was winking at us from behind it’s sulfur veil and I felt a little sick that we weren’t going to make it. But then it’s nice to breath oxygen and not sulpher. 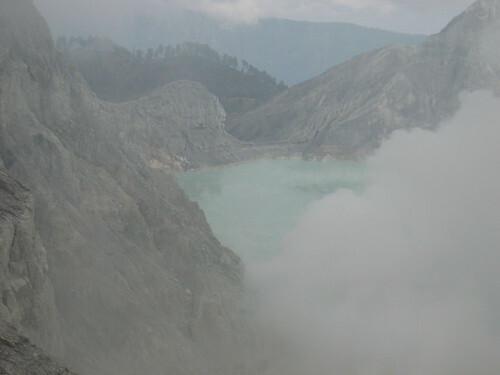 The Park Ranger in Ijen is a nice guy, we talked alot the day I waited for everyone else to show up. He told me that the minors haul 17 tons of sulfur out of that crater a day in the thick gaseous haze hacking at sulfur and hauling it off. The first year the sulfur eats away most of their teeth, they get less than five dollars American a day. The Ranger also told me that this mine opened in 1967, sulfur renews itself as it is a gas which goes through all phases of matter to solidify into a chaulky yellow powdery solid. This tells me that on any day since 1967 this mine made enough money (I don’t know the street value of 17 tons of sulfur but it’s got to be something, yeah?) to buy gas masks and goggles for their minors and in all that time just hasn’t bothered. When I think of those poor men, teeth falling out, hauling more sulfur on their backs up mountains than I could even lift, and I think about some rick pinche fat cat sitting in a mansion with sons who will never have to work, who have never smelt sulfur fumes, who had parents with the forsight enough to buy a sulfur mine, well it makes me really, really mad. Talk about your haves and your have not’s. Down the mountain we went. Slowly but surly our lungs started funtioning the right way again, everything was cool, then the rain started. That part sucked and I will tell you all about it in one or two days so please stay tuned. This entry was posted on Tuesday, September 29th, 2009 at 2:14 pm	and is filed under Indonesia, Lost in Translation, Travel, tough going. You can follow any responses to this entry through the RSS 2.0 feed. You can leave a response, or trackback from your own site. Maybe you should start waiting until you’ve had one complete conversation with someone before you go giving out your phone number. Then again, if you did, we’d miss all the fun! Man I bet there are some nice hot springs out there Willie. Have a beer for me and Andy while you’re at it. What are you going to be for Halloween this year? I read an article about those sulfur minors on the BBC. That’s some tough stuff alright. I feel special to have the inside story from the dude that was there. I’d like to know how much more frequently you find a beer under your pillow then your average Joe. 100,000:1?